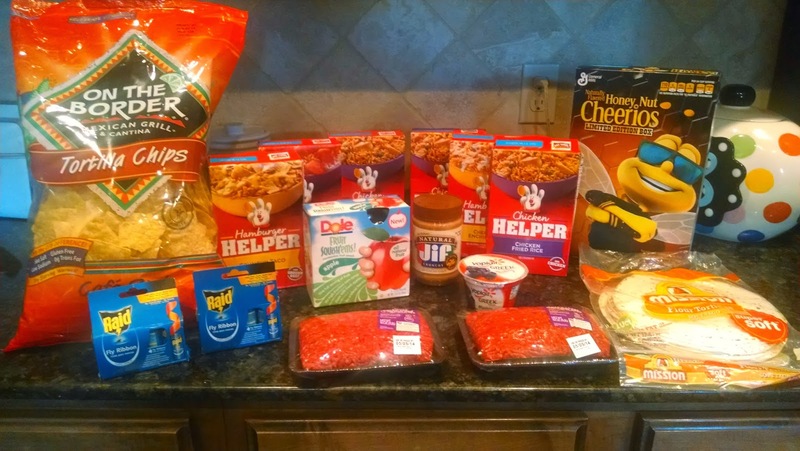 With rebates and discounts I ended up paying right over $11 for everything pictured, using mostly printable coupons. (As I was typing this I realized that I forgot to put the produce in the picture, I price matched bananas ($.33/lb), strawberries ($.99/16 oz) and avocados ($.33 each) today too so they're part of the $11!). Also, there is a Checkout 51 rebate for $.25 on Avocados this week too. So I paid $0.74 on three avocados with a retail value of $4! There is a great deal with Walmart where you buy 3 Hamburger Helper Varieties and up to $6.44 in ground beef and you can submit a rebate to get the beef for free. You can do this up to two times per households. There is also $1/2 coupon on coupons.com for the Hamburger Helper right now which makes this deal even sweeter! The rebate is on coupons.com too! The Raid fly strips were $0.75 each and I had a coupon for $2/1. So I made $2.50 total on these. I had a coupon to get the Dole Squish-ems for free. I got the Jif free with a Shopmium rebate (use code GHUMKEWP to get a free Lindt bar offer) and the yogurt free from an Ibotta rebate. This version of Honey nut cheerios (Rhett's fav) was on sale and I had a coupon for $0.55/1. I just needed the chips and tortillas for the weekend. Good shopping day with a rare rebate on meat! We usually don't use hamburger helper but I bought mostly the Chicken Varieties for Chicken Fried Rice for Bryan's lunch. And even if I donated these, I still saved money on the meat! Great deal. Another tip if you shop with rebates, submit them first thing when you get home so you don't forget!